Valentine's Day is just about 3 weeks away. While it's safe to say that I decorate way more for other holidays, I still enjoy pulling a few of my favorite Valentine's Day pieces out each year. 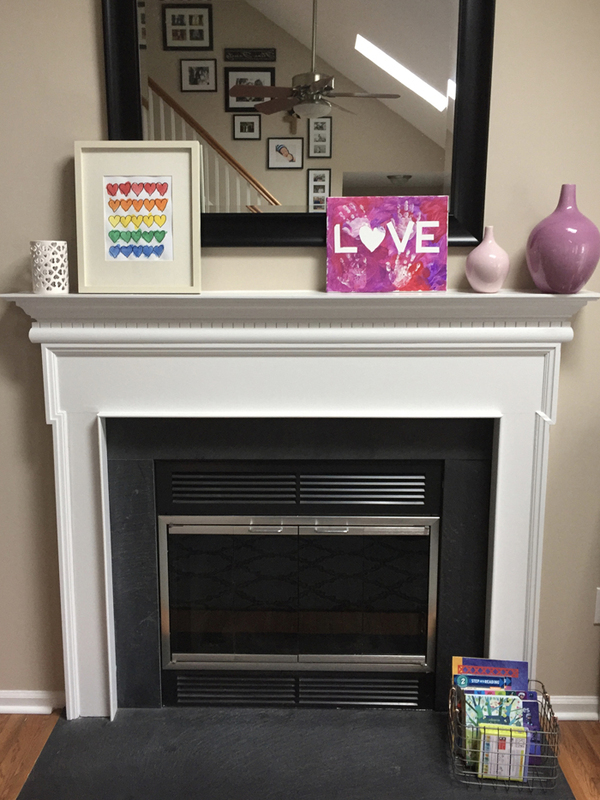 I really love adding a few touches of red, pink, and hearts to my mantel and dining room sideboard. And thanks to Noah and his artistic side, I am adding a new one of kind art piece to display each year. Last year, I had Noah paint a canvas using the tape-resist technique. Not only do I love that it says LOVE, but I also love that Noah's little handprints are all over it :). This year, I decided to try something new. 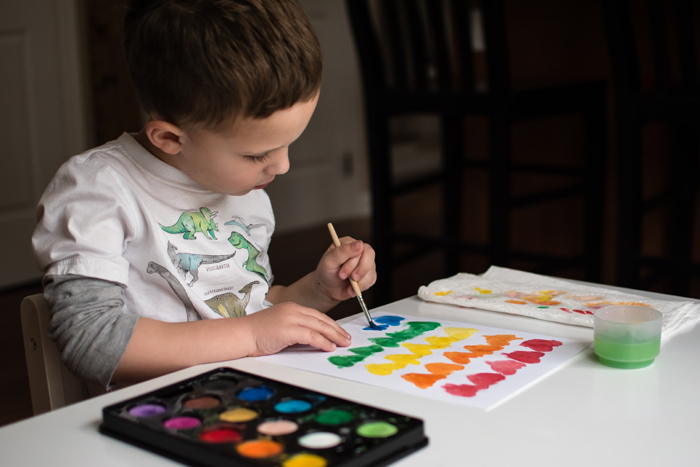 Noah is becoming more and more precise with his coloring and painting skills, so I thought it may be time to try something a little more advanced than just mixing paint all over. 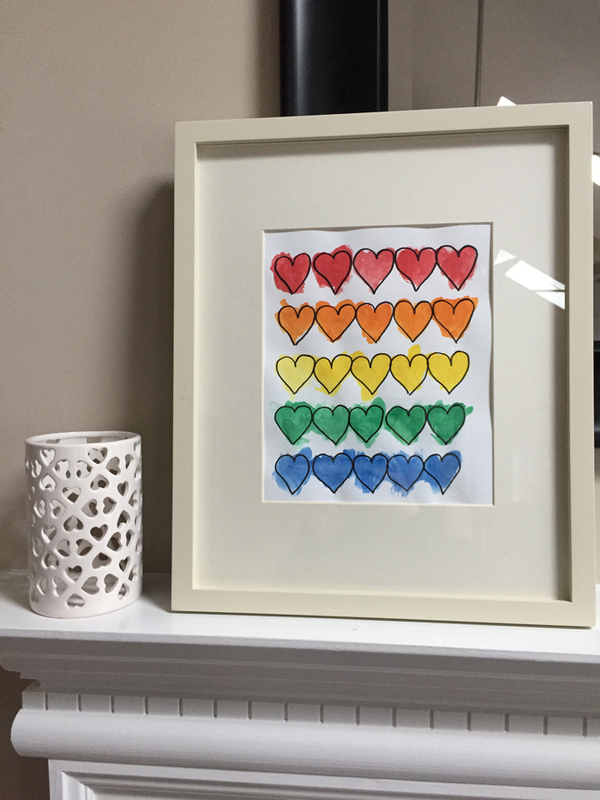 I found this watercolor hearts idea on Pinterest and knew that if Noah wasn't interested in doing it, that I would be doing it myself. I really loved the look of it and couldn't wait to see how Noah made it his own. If planning to frame, cut your card stock down to 8X10. Using a ruler, I plotted out 5 even spaces to draw my hearts. This is where some basic math skills will be helpful. Using the ruler as a guide to stay straight, I drew 5 hearts across the paper. This doesn't need to be perfect, so just do your best drawing hearts. If your kids are older, you can even have them help with this step. Paint in the hearts with watercolor paints. Once dry, if the hearts need some more definition (due to not staying perfectly within the lines), you can use a black Sharpie to outline the hearts. Now you can frame (or not) and display! 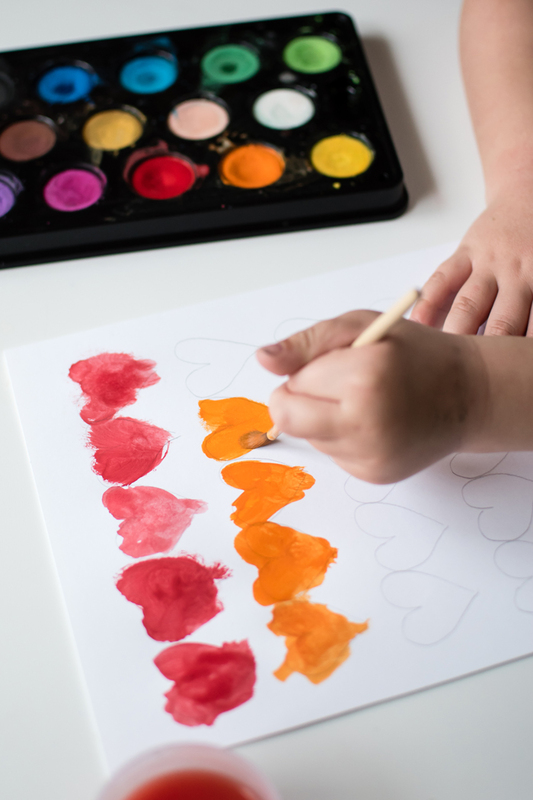 When planning this craft, I had envisioned using different shades or red, pink, and purple paints. But Noah was kind of against it being a "Valentine craft" and wanted to paint it rainbow colors instead. He's becoming more and more independent with his crafts and often has a very clear artistic vision that is different than mine. I want to foster this creativity, so I'm letting him take the lead. I did however warn him that I didn't make enough lines to have all the rainbow colors, but he seemed okay with having to leave purple out. While Noah was very careful, he is only 4, and ended up painting a little outside the lines a bit. Some of his hearts looked a little more like a blob, so I suggested outlining them with a black marker, and he thought that was a great idea. I love how it turned out and I love seeing it framed on my mantel. And since he did decide to do rainbow colors, I think I could get away with displaying this all year round! I think it would look great as part of our gallery wall in the playroom part of our basement! This craft was so simple and fun that I'm still tempted to do one myself. I think painting a bunch of hearts could be rather cathartic! 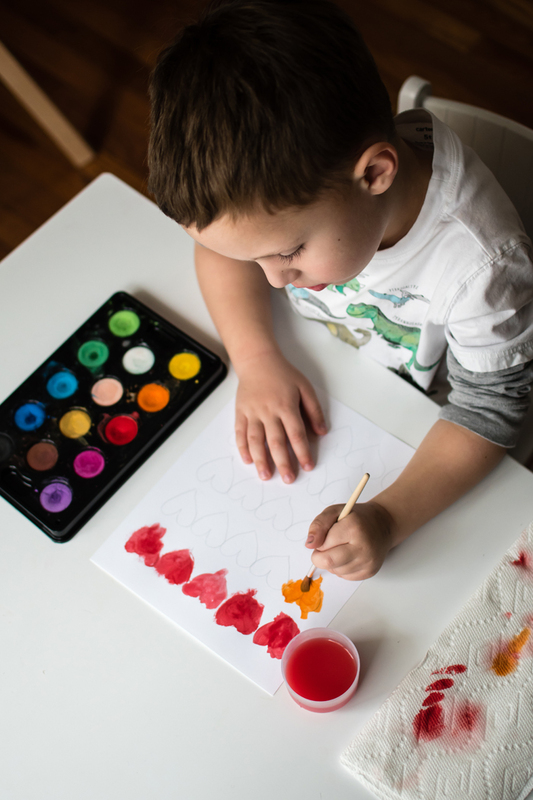 Do you like creating holiday artwork with your children? Either to give as gifts or to display in your own home? I LOVE this so much!!! Seriously so easy and it looks like professional artwork! I think I might have Mason try this this week! He's actually FINALLY gotten into crafting... a little! I think this would be an excellent way for Connor to practice hand control and staying in the lines. I might not get to this for Valentine's Day but maybe St. Patrick's Day! I love this! It came out great. 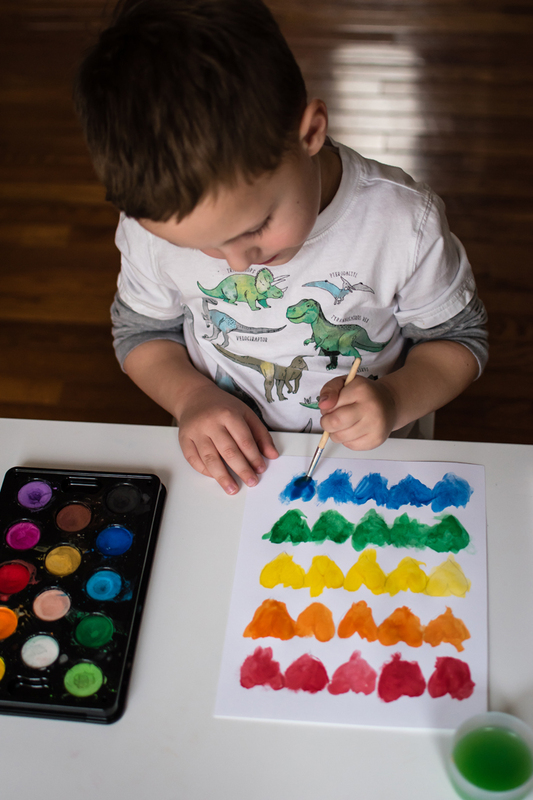 What watercolor palette do you have for Noah? Ours are small and I like the look of the one you have. This makes me SO happy. It is SO pretty! I think we may be adding this to our to do list this week! Oh I love it! I wonder if I could get Mason to make one! !